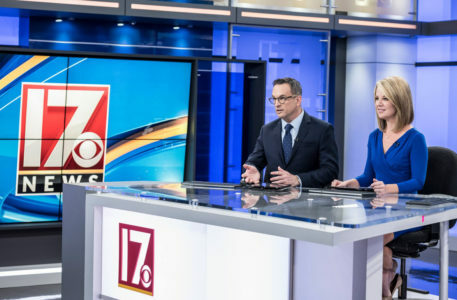 WNCN, Nexstar’s CBS affiliate in Raleigh, North Carolina, has introduced a new brand that includes a new name, logo, set and graphics package. The launch was timed with the tipoff of the NCAA Men’s Basketball Tournament, which airs on CBS. 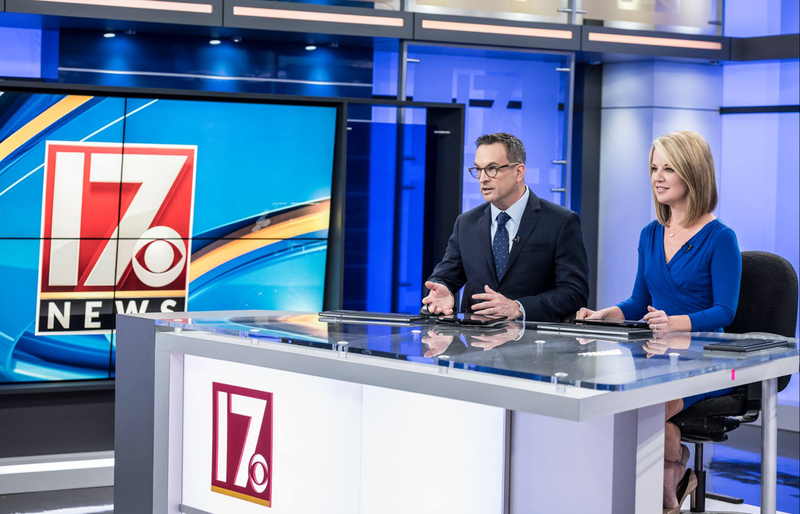 With the change, the station is now branding as “CBS 17,” with “CBS 17 News” for newscasts, formerly using the “CBS North Carolina” moniker. The station also debuted a new logo in bold red, white and black with a gold accent, using clean typography with a prominent angle in the “7” and the CBS eye tucked to the right. 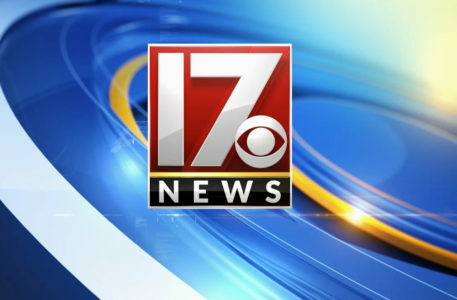 The new color scheme, which has also been carried over to a new graphics package, is a departure from the station’s previous blue and silver look and also gives the station a more unique look; the market’s other two major affiliates WRAL and WTVD use a two-toned blue and gold logo, respectively. The graphics mirror the same look debuted on Nexstar’s WROC. 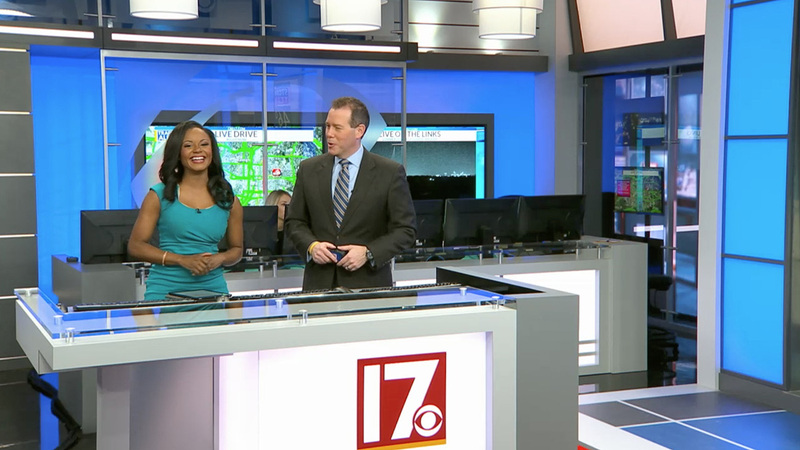 In addition, WNCN has installed a new set from FX Design Group featuring backlit panels along with internally lit boxes, combined with video walls, frosted glass and metallic grids arranged at sharp angles. Four vertically mounted 90″ Sharp video panels are used to form a faux window arrangement, while the station’s new logo is featured prominently on the walls and anchor desks. The set also features a working weather center and two additional monitor walls, including a 3×3 and 2×2, comprised of NEC 55″ displays. Digital Video Group handled the AV integration, with the monitor walls powered by a TV One Corio Master. 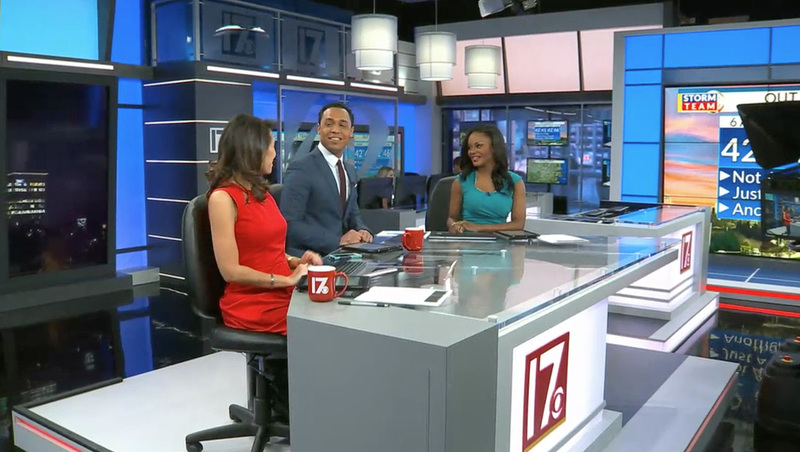 The station also switched to using the website address “CBS17.com,” although its Twitter and Facebook accounts still reference the call letters. WNCN’s previous logos, with the most recent at the top. WNCN, which was an NBC O&O until 2006, has only been a CBS affiliate since 2016, when it swapped affiliations with WRAL. Previously, it was known during its peacock days as “NBC 17” and also had a three-year stint where its logo focused more on its call letters. When it became a CBS affiliate in 2016, the station switched to the “CBS North Carolina” branding.